Download the eSSENTIAL ACCESSIBILITY app for free, and enjoy the freedom to surf the web anytime here. San Diego Pride is dedicated to ensuring that all of our guests experience a wonderful weekend. To make this possible, we have created an array of features designed to make Pride and its events accessible to everyone. Information & resources for accessibility at Pride can be found here. Here at Pride, we strive to make your visit enjoyable and accessible; if you are unable to find information for an accommodation, a service, or if you have a general question regarding accessibility, please contact us at [email protected]. We will get back to you with an answer within 24-48 hours. Image Description: banner reading ACCESSIBILITY in white letters on a teal background. Underneath are icons related to various accessibility needs: wheelchair user in forward motion, two hands signing “interpreter”, a person using a white cane, a person’s brain, a Braille symbol, and a question mark. End Description. Seating will be reserved in front row. Ushers available at your request. Please Note: Seats are available on a first-come, first-served basis. Accessible Senior Seating: This year Pride will have two tented Accessible / Senior Seating Areas. The first accessible / senior seating area is located on the southwest corner of University Avenue and Richmond Street. The second accessible / senior seating area is located at the 6th Avenue and Upas Street intersection. Both Accessible / Senior Seating areas are wheelchair accessible. Note: Reservations must be made in advance for the Accessible / Senior Seating and these seats are available on a first-come, first-served basis. Avoid waiting in long lines. Request a companion ticket, or request assistance by using the main gate’s accessibility ticket line. Ask anyone from the accessibility team or any of our new festival ambassadors whom you will find roaming both inside and outside the festival. Accessible volunteers will sport teal blue shirts with accessibility icons on the back. Accessible pathways and routes throughout the venue including ten wheelchair ramps. Two, one located in upper level and one in the lower level. Sponsored by our community partner FOG (Fellowship of Older Gays). 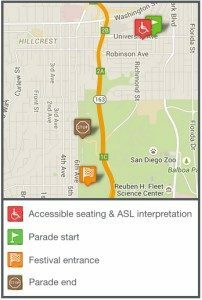 I need an ASL interpreter in order to attend an event! If you need an ASL Interpreter to fully participate in meetings, trainings, workshops, and other Pride events open to the public, please put in your request at least one week prior to the event. Email all requests to [email protected]. Cancel at least twenty-four hours prior to the event if you are unable to attend. Pride is charged if we do not cancel the interpreter with at least twenty-four hours’ notice. Please be on time if you have requested an interpreter. Interpreters will wait twenty minutes after an event’s start time, and if the person requesting the service has not arrived, the the interpreter will leave. Note that Pride will still be charged the full cost. I can't find my accommodation need or have a specific accommodation request! Please contact [email protected] for any accommodation requests not listed on this page. Do you have accessible shuttles to and from the event? Yes! Please visit our shuttle page to learn about the times and locations of our shuttle. Click here. Service animals perform tasks for their handlers related to the individual’s specific disability. The person does not need to have a physical disability to have a qualified service dog. Dogs that are exclusively emotional support dogs, however, are not trained to perform a specific task related to a disability. Instead, they benefit a person with a disability simply by the unique nature of the bond between canine and human. Such dogs are not legally granted the same rights as service dogs. Recognizing that some individuals with certain disabilities may need their canine companion to fully participate in events at Pride, Pride will admit an emotional support dog that has documentation of the role they play in their handler’s life. Our thanks to everyone who works diligently to make all that Pride does accessible to everyone in the LGBT family. From Pride’s staff to our legions of volunteers, both during our July celebrations and throughout the year, everyone has shown a commitment to include all our community members by dedicating their time and talents to our efforts. All that we do would not be possible without these individuals, and we appreciate each and every one.